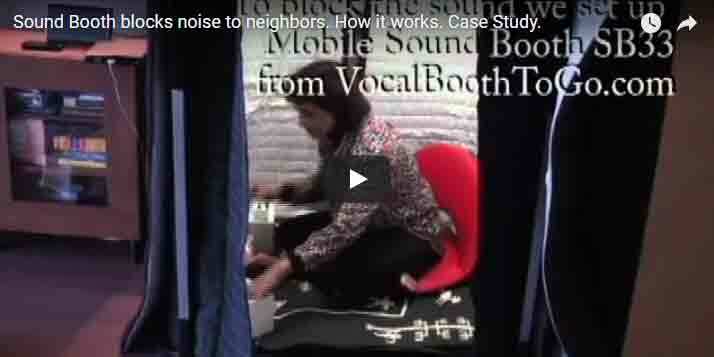 Sound Booth blocks noise to neighbors. This video explains how it works. Noise from Neighbors is the number one reason for noise complaints, create a lot of animosity between neighbours. NOISE is the UNWANTED sound, so even if the noise is within the city ordinance, people would complain if they do not like what they hear. No matter how quiet the noise is, if it is heard next door, it can trigger the complaint. This Singer had the problem just like that. It got to the point that she was on the verge of choosing between her passion – singing, and her work. She had relocated for work to NY on a temporary assignment, and now she had to find an option that would allow her to keep the job, continue singing, keep friendly neighbors and not waste money on improving a rental apartment. Sound booth from VocalBoothToGo.com solved all these issues. As an added bonus, when she leaves – she can take the booth anywhere she goes. This entry was posted in Mobile Soundproof(er) Isolation Booth, Videos and tagged apartment living and noise, keeping peace with neighbors about noise, noise control, sound booth, sound booths for singers, vocalboothtogo.